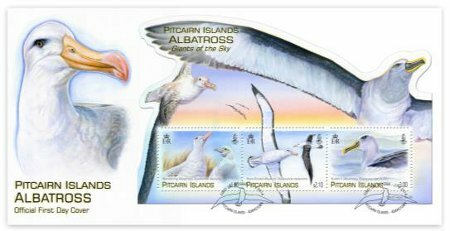 These magnificent “giants of the sky” roam the southern oceans and Pitcairners are fortunateto experience the thrill of seeing these magnificent birds, mostly out at sea. Wandering Albatrosses have the largest wingspan of any living bird, typically ranging from 2.5 to 3.5m and are capable of remaining in the air without flapping their wings for several hours. Spending most of their life in flight, their range is all the southern oceans from 28° to 60°. The length of the body averages 120 cm (with females being slightly smaller) and they weigh between 6.5 and 12kg. Plumage varies with age, with the juveniles starting chocolate brown changing to white bodies with black and white wings as adults. The large bill is pink, as are the feet. They also have a salt gland that is situated above the nasal passage and helps desalinate their bodies, due to the high amount of ocean water that they imbibe. They can live for over 50 years and pairs of Wandering Albatrosses mate for life and breed every two years. Breeding takes place on sub-Antarctic islands and one egg is laid usually on an exposed ridge near the sea. During the early stages of the chick's development the parents take turns to sit on the nest while the other searches for food. They are night feeders and feed on cephalopods, small fish and crustaceans and on animal refuse that floats on the sea. The International Union for Conservation of Nature (IUCN) lists the Wandering Albatross as "vulnerable" status. The biggest threat to their survival is long line fishing however pollution, mainly plastics and fishing hooks, is also taking its toll. The Black-browed Albatross, also known as the Black-browed Mollymawk, is a medium sized, pelagic albatross, at 80–95cm long with a 200–240cm wingspan and a weight of 2.9– 4.7kg. Living up to 70 years, its colouring is a dark grey upper with white underparts. The bill is orange-yellow and its unique dark eye-stripe gives it its name. 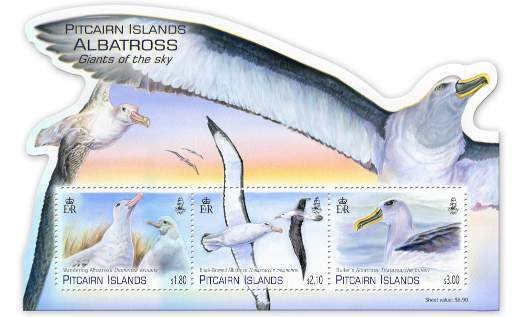 The Black-browed Albatross breeds on 12 islands throughout the southern oceans. There are an estimated 1,220,000 birds alive with 600,000 breeding pairs (2005). Colonies are very noisy as they bray and cackle to mark their territory. 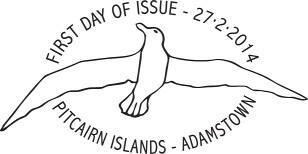 The bird feeds on fish, squid, crustaceans, carrion and fishery discards. This species normally nests on steep slopes covered with tussock grass. They lay one egg which is incubated by both parents and after hatching, the chicks take 120 to 130 days to fledge. Until 2013, the IUCN classified this species as "endangered" due to a drastic reduction in population and nesting sites. The overall situation is grim, with a 67% decline over 64 years. The Black-browed Albatross is the most common bird killed by fisheries through increased long line and trawl fishing in the southern oceans. is a small mollymawk in the albatross family. It breeds on islands around New Zealand and feeds in the seas off Australia and the South Pacific. Buller's Albatross averages 80cm. in length and has a silver-grey forehead, with a grey head and throat. It has a black patch around the eyes with a white crescent behind and below the eye. Its back, upper-wing and tail are dark grey. Its bill is large and black with yellow colouring. The bird is colonial, nesting generally on cliffs, steep coastal terraces, grassy meadows and tussock-covered hills. The nest is a mound of soil, grass and roots and is set into depressions in the breeding area. Annual breeding results in one egg, with both parents sharing the responsibility for its safety. Feeding on squid, fish, octopus and crustacea, it is endemic to New Zealand. Juveniles and adults that aren't breeding disperse across the South Pacific, with a number feeding every year in the Humboldt current off Chile and Peru. According to a 1999 estimate there are 64,000 birds and there are 40,000 breeding adults. It was formerly classified as "vulnerable" by the IUCN, but new research has shown it to be not as rare as it was believed. Consequently, it has been down-listed to "near-threatened" status in 2008. Its main threat is also from fishing methods.